Spring flower nail tutorial with real flowers! You will need a base coat, feature polish, top coat, dried flowers, nail scissors, dotting tool & tweezers. A base coat is not needed, I use it because it limits the the stain on my nails when using bright colors and the flowers have a good bit of dye in the. You also don't need tweezers but it does make things slightly easier. First, prep for your manicure, to make it last longer. Remove your old polish, if any, and soak your hands in warm water for a few minutes. Trim your nails and push back your cuticles but don't cut them. Do not use lotions or oils on your hands before you start, it may make the dry time longer. The goods by Julep I used. I used just one bundle for both hands. Start by applying a coat of your base color, give it a minute or two to dry. Apply a coat or two of the feature color. I let it dry for about 2 minutes, I also ran cold water over my nails to help it dry faster. I used my Rimmel top coat as a glue for the flowers. Apply a thin coat of the top coat you are using as glue and place the flowers on your nails the way you want the to lay. Until you are happy try not to press down to hard. The tweezers will come in handy with this part. Using your scissors cut the flowers near the base of the bundle. There is one stem that lost a flower when I cut the rest on my nail from the bundle. You can use your dotting tool to pick up any flowers that fall to apply on empty stems. Dip your dotting tool in a little polish and pick up a flower. Apply a little more clear top coat for glue if needed by the empty stem and apply the pick up flower. Apply as many or as few as you want to you nails, I did little burst of flowers on my nails. Give your nails a minute to dry then apply your polish. Using Julep's Freedom top coat dab over the flower so you don't have air bubbles and to cover the whole flower and so you don't move the flowers. Apply a thin or thick if needed coat to smooth things out. Let dry for five minutes and you are done! Enjoy your pretty spring nails! You can find the polish, base and top coat by Julep on their site. 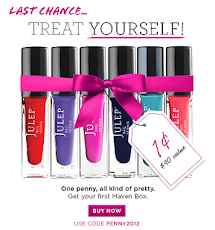 Become a Julep Maven and get your first box free with coupon code FREEBOX! Let me know what style you are! Use my code VRYENCH to get 20% off your first box! April Fool's day Crafts and Pranks. Try this to help you orgianize your nail art tape! July Ipsy Glam Bag Review! Nails of the day- Inspired by Water! New Polish- Tip Top Nails! 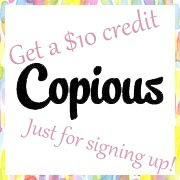 Become a maven & get goodies! FTC Disclaimer: Some links in these post are affiliate links and I will receive a credit or freebie if anything is purchased through them. All opinions are my own and I am not being compensated in any way to write these posts.